Tête de Moine AOP is a fantastic semi-hard Swiss cheese. The cheese has a very fine texture which makes it melt easily in the mouth, a real pleasure! This cow's cheese has been made by the monks of the abbey of Bellelay for eight centuries and one of its main characteristics is the peculiar cut in flower shape. It is recommended for appetizers and to complete a good cheese board. Cutting machine “Girolle” not included. The designation of origin and the particular scraping that gives rise to the 'Tête de Moine flowers' are protected by law from imitation. It is made from cow's milk grazed outdoors, the herbs and flowers that graze these animals is what gives it that special flavor and smell. 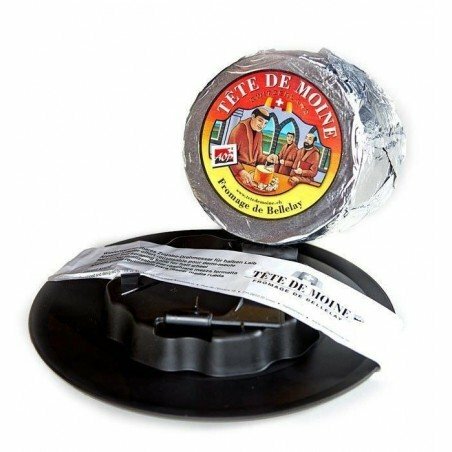 The literal translation of its name 'Tète de Moine' means 'Monk's head' and is due to the similarity of the scraping of the cheese with the haircut of the monks who produced it. They were the monks themselves, trying not to notice the wear of the cheese in the assaults on the pantries, who discovered that scraping it acquired a better taste by contact with the air. To enjoy the best taste of Tête de Moine there is a special slicer called Girolle. 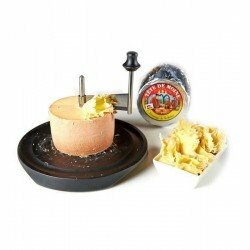 This professional machine makes it possible to make flower-shaped shavings by turning a blade that scrapes it around a shaft inserted in the centre of the cheese. Conservation: In cold with temperatures between 4 and 8ºC.